Developed with pediatric dermatologists, CeraVe Baby Moisturizing Lotion is a patented formulation containing vitamins and 3 essential ceramides. It moisturizes for 24 hours while protecting and maintaining baby's delicate skin barrier. 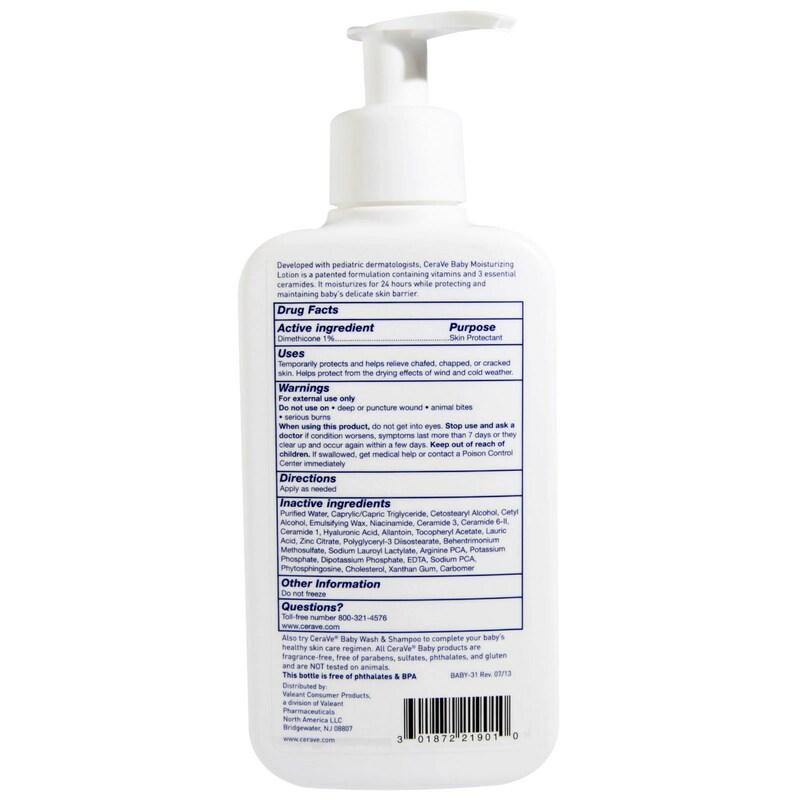 Temporarily protects and helps relieve chafed, chapped, or cracked skin. Also try CeraVe Baby Wash & Shampoo to complete your baby's healthy skin care regimen. 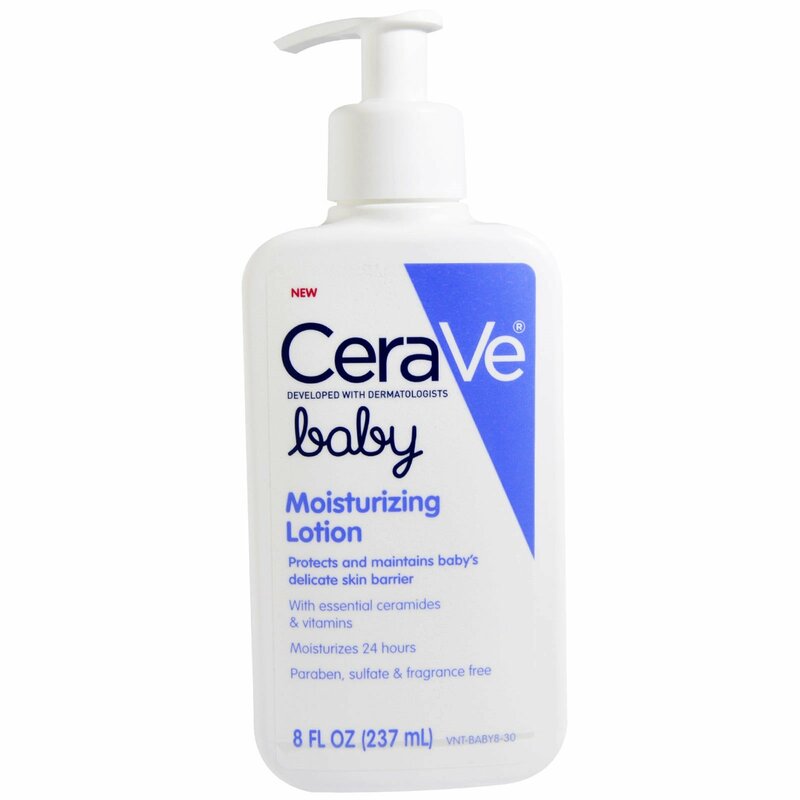 All CeraVe Baby products are fragrance-free, free of parabens, sulfates, phthalates, and gluten and are NOT tested on animals. Purified water, caprylic/capric triglyceride, cetostearyl alcohol, cetyl alcohol, emulsifying wax, phenoxyethanol, niacinamide, ceramide 3, ceramide 6-11, ceramide 1, hyaluronic acid, allantoin, tocopheryl acetate, lauric acid, zinc citrate, polyglyceryl-3 diisostearate, behentrimonium methosulfate, sodium lauroyl lactylate, arginine PCA, potassium phosphate, dipotassium phosphate, EDTA, sodium PCA, phytosphingosine, cholesterol, xanthan gum, carbomer, ehtylhexylglycerin. symptoms last more than 7 days or they clear up and occur again within a few days.